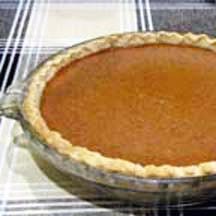 This recipe for classic pumpkin pie has been a family favorite for years. Beat eggs slightly in a large mixing bowl. Add remaining ingredients and beat just until well mixed. Pour filling into unbaked pie crust. Bake in a preheated oven at 425°F (220°C) for 15 minutes, reduce oven temperature to 350°F (175°C), and bake for 45 minutes longer, or until knife inserted in center comes out clean. Cool completely on a wire rack at room temperature. Store pie in refrigerator. Serve pie with a dollop of sweetened whipped cream, if desired. Tip: To help prevent the pie crust from becoming soggy, brush a thin layer of egg white onto unbaked pie crust. I find that the small bit of egg white left in the cracked egg shell halves (from the 2 large eggs) to be a sufficient amount. Use a pastry brush to gently spread the egg white over the bottom and sides. Nutritional Information Per Serving (1/8 of recipe): 289.1 calories; 38% calories from fat; 12.5g total fat; 66.6mg cholesterol; 440.6mg sodium; 296.9mg potassium; 38.9g carbohydrates; 2.7g fiber; 18.9g sugar; 36.2g net carbs; 6.8g protein.